A new interview with Harry Styles has revealed that he was the first One Direction member to raise the idea of the band taking a break. In the same interview, he discusses possibly reuniting with the group in the future. 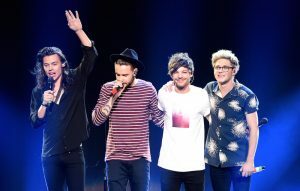 One Direction announced their hiatus in August 2015, five months after member Zayn Malik left the boy band in March of that year. However, in a new interview with Rolling Stone, it’s revealed that the group first talked about going their separate ways in late 2014. Elsewhere in the interview, Styles responded to Zayn Malik saying that One Direction is “not music I would listen to” and opened up about his relationship with Taylor Swift. The singer recently launched his solo career with lead single ‘Sign Of The Times’. His self-titled debut album will follow on May 12. The post Harry Styles explains why he wanted One Direction to take a break and speaks about possible reunion appeared first on NME.